Yida, the largest refugee camp in South Sudan, stretches for miles. It is home to more than 64,000 of the 206,000 refugees from the Republic of Sudan who have fled the bombing and violent attacks against civilians by the Khartoum government since June 2011.Yida camp itself was bombed Nov. 10, 2011, killing 12 refugees. Only 20 kilometers from the volatile border between Sudan and South Sudan, Yida camp sees a constant stream of nearly 200 new refugees a day, coming from the Nuba Mountains region (South Kordofan State) in Sudan. Rebel groups in Darfur, South Kordofan, and Blue Nile states have united against the Khartoum government’s army, Sudanese Armed Forces (SAF), whichindiscriminately attacks rebels and civilians in those areas. Yida camp continues to grow, as attacks on the Nuba Mountains by the SAF haveincreased in intensity during the past month. The U.N. expects as many as 90,000 people to occupy the camp by the end of the year. In January 2011, a referendum was held in which citizens of what was then southern Sudan decided overwhelmingly to secede from the north and become an independent nation. Six months later on July 9, 2011, the Republic of South Sudan was born. The referendum was specified in a Comprehensive Peace Agreement (CPA) — signed in 2005 between the north’s Khartoum-based Government of Sudan and the south’s Sudan People’s Liberation Movement — that ended a decades-long civil war that killed more than 2 million people and displaced an estimated 7 million more. Although conditions on the ground have improved in much of South Sudan since the referendum, fighting along the border, especially in disputed areas, has intensified. Four thousand members of the Episcopal Church of the Sudan’s Diocese of Kadugli now reside in Yida camp. They have four churches organized in different parts of the camp, and seven priests. The ECS churches are made up of many tribes worshiping together. They support one another in prayer, and help the most vulnerable among them, especially the widows and orphans. Conditions in the camp are desperate. In July, the daily mortality rate was three deaths per 10,000 children under five, and one death per 10,000 adults. In August, the rate reduced to one death per 10,000 children per day, still at the emergency threshold, according to U.N. data. There are several medical stations in Yida where people can receive care, but the lines are long. “Sometimes people can stand all day and be told to come back the next day. The next day can be too late for them,” said Kukuri Mathias, a nurse and ECS member. There are seven certified nurses and six nurse assistants who are ECS members in Yida. In response to the desperate need for medical care, they run a free clinic. They set up a simple grass structure with two beds where they can admit people. With donations from the refugees, they sent someone traveling for three days by foot through flooded territory to reach Pariang, the nearest town to Yida, to buy medicine. These medicines have now finished. The Sudanese Development and Relief Agency (SUDRA), with assistance from Episcopal Relief & Development and Hope International, is seeking to get more support to the refugees in Yida. Some medicines from SUDRA are currently in transit to Yida. Episcopal Relief & Development will soon send additional support for SUDRA’s work there. But more is needed. Because Yida is classified as a transitory camp, the United Nations refugee agency UNHCR does not provide assistance for agriculture or education. Desperate for more food, the refugees in Yida have planted around their homes seeds they brought with them from the Nuba Mountains, but the tools available to them are few and far between. Desperate for education, refugees have organized community schools, with volunteer teachers. Most of the teachers have not been trained, and supplies are so few that more than a hundred people cram around a small blackboard. These make-shift schools service only a small fraction of those who desire education. “My first priority is education, and second is agriculture,” Bishop Andudu Adam Elnail, bishop of Kadugli diocese, which includes Nuba Mountains, reported after his recent visit to Yida camp. Most people from the Diocese of Kadugli have been displaced either into the camp or into the mountains. The civil war in Sudan reaches beyond the Nuba Mountains, including Darfur, and Blue Nile state as well. Approximately 655,000 Sudanese have been displaced from Blue Nile and South Kordofan States. Former U.N. Coordinator for Sudan, Mukesh Kapila, said that the current conflict in South Kordofan is even worse than the famous Darfur genocide which began in 2003. Video evidencefound by the rebels and released by Al Jazeera shows government soldiers being instructed to leave no one alive. Evidence of mass graves has also been gathered by the Enough Project. Because U.N. and humanitarian organizations have been banned from the area by the Khartoum government, there are not solid numbers regarding casualties, many thousands have died. But it is clear that urgent action is needed from the international community to curtail the violence and ensure humanitarian assistance. – Robin Denney from the Diocese of El Camino Real was an Episcopal Church missionary in Sudan from 2009-2011 and served as an agriculture consultant to the Episcopal Church of Sudan. She recently returned to South Sudan to visit some of the church’s agriculture projects and the Yida Refugee Camp. Throughout several decades of civil war, the Episcopal Church of Sudan kept 2,000 schools open, mostly under trees – a testament to its commitment to educating its people. Episcopal Church missionary Robin Denney discusses her agricultural ministry in South Sudan with The Rev. David Copley, Mission Personnel Officer for The Episcopal Church. Photo by Matthew Davies. Today, with 4 million members, the Episcopal Church accounts for almost half of the south’s population. It is one of the biggest social service providers in the country, and as such is strategically positioned to reach deep into the hearts of local communities. For Robin Denney, development work is about the changing of hearts and minds, and through her service as an Episcopal Church missionary in Sudan she’s witnessed those transformations in abundance through the church’s ministry. 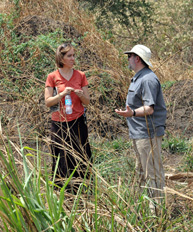 Denney, of El Camino Real, and Larry Duffee, an Episcopal missionary from Virginia, have traded in their lives in the U.S. to share their gifts and play a small part in helping to rebuild South Sudan, just four months away from independence after voters in a January referendum almost unanimously chose to secede from the north. Denney’s agricultural training and Duffee’s business and financial background are valuable assets for the South Sudanese, who are eager to learn the necessary skills that ultimately will lead to self-sufficiency in their nation, plagued by decades of civil war until the signing of a peace agreement in January 2005. While serving in South Sudan, the missionaries have been teaching pastors and community leaders at Bishop Gwynne Theological College, an educational institution in Juba run by the Episcopal Church of Sudan. A video report on the missionaries’ work is here. Denney has lived and worked in South Sudan for just over two years. She has established an agriculture department for the Episcopal Church of Sudan and she takes her expertise to almost every diocese, offering workshops and hands-on experience, especially in more rural areas of South Sudan that are not experiencing the same level of growth and development as the capital, Juba. In her first year, she worked primarily on training and preparing communities for agricultural projects and her second year saw those plans move towards implementation. The main farming projects are located in Eastern Equatoria, Yei, and Yonglei states, where the communities are now harvesting crops such as sorghum and sesame. Most of the workers are volunteers and are learning new skills while simultaneously experimenting with new techniques to explore the yield potential of the land, Denney explained. “We realized that farmers are really interested in trying improved techniques if they can do it in a risk-free environment,” she said. With that in mind, on one 10-acre farm in Panyikwara Abara half of the land was used to try out new techniques while the other half was cultivated with more traditional practices. “The improved techniques performed significantly better,” Denney said. Last year, nine out of 10 officers who’d been involved in the projects had already implemented mulching (a protective cover placed over soil), and seven out of 10 had begun planting crops, Denney explained. She expects that number to be higher this year. Denney needs to ensure that when she leaves in April, there are sufficient people trained in the agricultural skills she has brought. So far, 11 diocesan agriculture officers have graduated from Bishop Gwynne Theological College and are now working in their local communities. Fifteen more graduates are expected to return to their dioceses later this year. Denney’s ministry and friendship is greatly appreciated throughout South Sudan, as evidenced recently when a family in Panyikwara Abara named their newborn child Robinsida in her honor. The Rev. Emmanuel Lomoro Eluzai, chaplain to the bishop in the Diocese of Ibba, has been one of Denney’s students at Bishop Gwynne Theological College for the past year. He said that education is critical for the stability and growth of South Sudan. Through Denney’s training, he’s learned valuable farming skills, such as rotating certain crops between different terrains each season to ensure that the soil is not starved of essential nutrients. “During the war, many people did not go to school. That is why we need education now in Sudan, because without education there is no development,” he said. As well as providing training, Duffee brings financial skills to the provincial office, where he has set up systems to enable regular accounting to the church’s international partners.